An extraordinary war game with focus on survival. It was inspired by the real stories of people who at some point of their lives struggled to survive a war. The game was developed by Polish studio 11 bit, known for an original strategy game series Anomaly. This War of Mine for PC, AND and iOS is inspired by real events. The game is set during a modern conflict, where the theme of survival under unfavorable conditions has been strongly emphasized. The game was developed by Polish 11 bit Studios, which has previously created the award-winning and critically acclaimed Anomaly series - a representative of the inverted tower defense genre. In contrast to other games, this one is set in the realities of war. 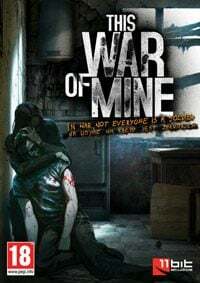 In This War of Mine the players take control over a group of civilians whose primary objective is to survive in the besieged city - constantly surrounded by threats to their life and faced with unpredictable situations created by the constantly changing conditions on the battlefield. During the game, the players have to deal with hunger, lack of medications, and the dangers of snipers’ attacks. An important role during the game plays the day and night cycle, which determines players' activities. Going outside during the day, and stumbling upon a place controlled by either of the fighting side results in immediate death, forcing the players to focus on repairs and shelter improvements during day hours - the game allows the players to craft weapons, furniture, basic tools, or brew alcohol using stored items. It is also important to take care of the health and physical condition of the civilians. Under the cover of night, the players can finally leave the shelter and go out on the streets in search of some things that will support our characters' daily existence. The creators tried to create an atmosphere of uncertainty and constant, tense struggle. The players are forced to make difficult decisions and choose between life and death on numerous occasions. Many times, they have to sacrifice the life of one of the civilians for the common good and the consequences of their actions affect the physical and mental conditions of the whole group. Additionally, there is an option available which can generate random levels and characters. It provides a great diversity of challenges and unique locations for the action to take place. This War of Mine for PC, AND and iOS depicts the action in the style of a 2.5D platform game - the game world is designed in 2D and interactions with the environment are achieved using various icons, allowing the character to take the appropriate steps. The war and survival theme is emphasized by the dark, gloomy style and the graphic design is based on a system of lights and shadows. Guide to This War of Mine contains a comprehensive walkthrough for overall game mechanics.